Hand-painted table linens featuring autumn leaves and gourds will help you set a beautiful, bountiful table for fall gatherings. 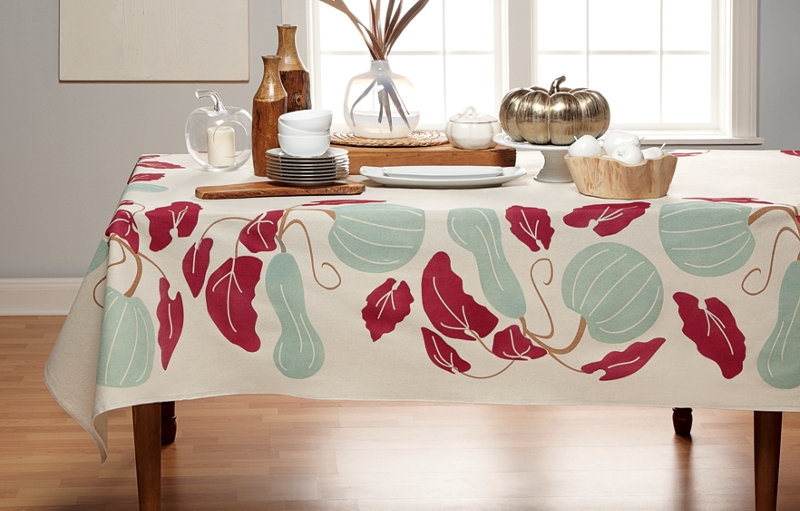 Harvest Tablecloth was designed by Vicki O'Dell. Multiple drop cloths may need to be purchased in order to find one suitable for this project. Look for cloths that are evenly hemmed and without soil or large defects in the fabric. Create a work surface that will allow the drop cloth to be laid out flat and pulled taut. Iron the drop cloth smooth. Using the binder clips attach the drop cloth to the surface pulling taut and making sure there are no wrinkles. Protect the work surface or overspray area with newspaper. Create artwork and cut vinyl or purchase a large stencil. Select a color to begin with (usually the lighter colors first) and then tape off areas that won't be painted with newspaper and painters tape. Paint open areas with Krylon® ColorMaster™paint. Let dry and remove the masking. Continue to mask, prime, paint and let dry until the tablecloth is covered in the design. Allow the tablecloth to cure for 72 hours and then heat set with the iron (no steam) before using or laundering.